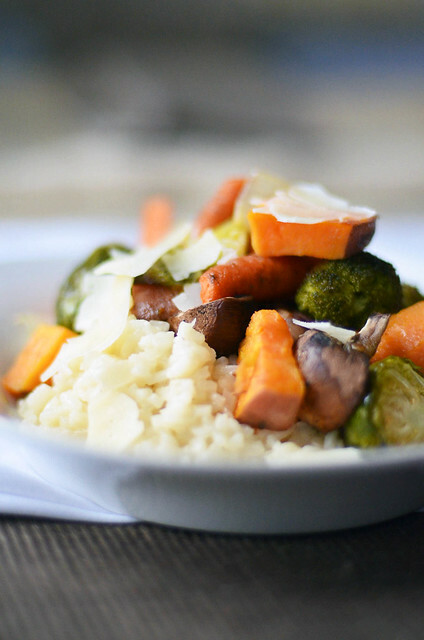 You are here: Home / All Recipes / Baked Risotto with Roasted Vegetables. 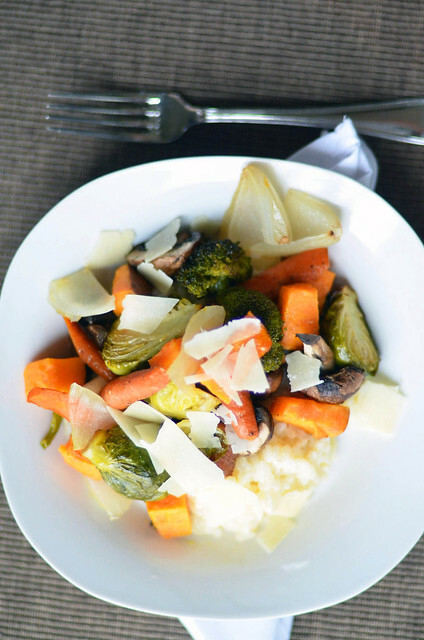 Baked Risotto with Roasted Vegetables. I don’t eat a lot of meat. Be it breakfast, lunch, or dinner…meat is not likely to show up on my plate. Now don’t go thinking I am a vegetarian, because you would be wrong, and I don’t like telling people they are wrong. I feel very awkward when bringing it to someone’s attention, that perhaps what they said might be all kinds of not right. I will try my hardest to get them to notice their mistake before I have to flat out tell them. Anything to avoid the awkwardness. And if the mistake isn’t going to harm anyone …i.e. calling me Melody instead of Mallory. Or Mindy, or Valerie, or Molly. OK, fine … if it starts with an ‘M’ or rhymes with Mallory…I’ll answer. For reals. Or perhaps you like calling my cat a she instead of a he…thats cool, he is actually an ‘it’ anyways. I am a fan of letting things slide. But mistaking me as a vegetarian would be all kinds of wrong…seeing how a few short hours ago, I devoured a medium-rare steak and was moments away from licking the plate had the waitress not arrived at the table. So, yeah, this gal is not a vegetarian…I however, very rarely, if ever cook meat in my own kitchen. I’ll order the hell out of it at a restaurant….but I halt when it comes to dinner at home. It is not that I can’t or don’t know how or lack the skills….I just don’t. It is what it is…Honeslty, it has a lot to do with my lack of preparedness. Who remembers to pull out chicken breast from the freezer at 5:30am? Not me. For those of you that do …big high-five. You are totally winning this game we call adulthood. Point, you. You see, it dawns on me around noon, that once again, the chicken is still in the freezer. And since I don’t have a land line and Stan doesn’t understand English..the chicken remains in the depths of my freezer. Aw shucks. Therefore, most nights…I have an egg sandwich and a salad. 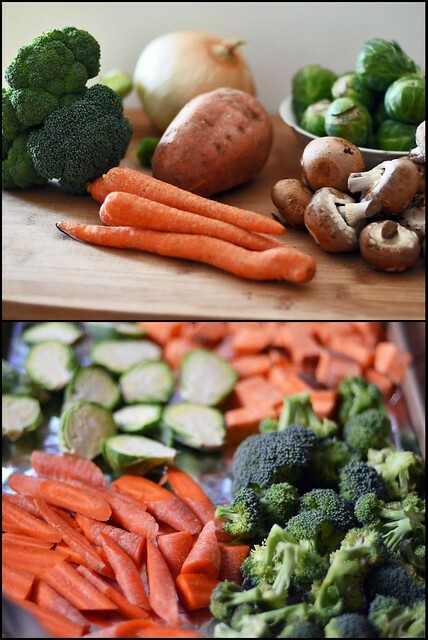 Or I roast some vegetables and warm a bowl of lentil soup. These are a few of my go-to’s. This fall, I have added a new go-to that is quick, simple, and versatile and pairs wonderfully with roasted vegetables. 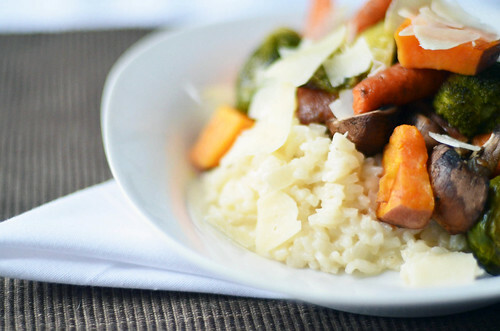 Baked risotto. I have whipped this up at least 3 times this fall already, which is saying something since I have a 1.65million recipes that I have bookmarked, dog eared, and post-it noted that I am just dying to make…Baked Risotto with Roasted Vegetables is great as a main dish with a glass of red wine on a cold evening, or can be a side dish to roasted chicken or pork chops. Baked risotto is all kinds of creamy and cheesy and comforting and requires absolutely no stirring, no hovering over the stove for an eternity while your rice slowly absorbs multiple ladles of warmed chicken broth…nope, none of that. The oven does all the work…giving you twenty minutes to unwind and enjoy that glass of red wine that has been calling your name since noon! Serves 2-3 as main dish. 4 to 6 as side. 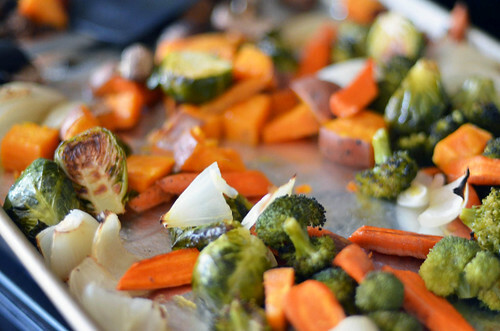 Line a large baking sheet with tinfoil and lay chopped vegetables, minus mushrooms, in a single layer on baking sheet. Drizzle with olive oil, sprinkle with salt and pepper and place in preheated oven for 45 to 50 minutes, until fork tender. Add mushrooms when 20 minutes are left in cooking time. Meanwhile, once vegetables are in oven begin risotto. Heat olive oil over medium-high heat in dutch oven or another pan that can be transferred to oven. Add onions and cook until translucent - about 3 to 5 minutes. Add rice and stir to coat with oil. Add white wine and cook until most of the wine is evaporated ( about 3 minutes). Add 2 Cups of chicken stock, salt, and pepper. Bring to boil. 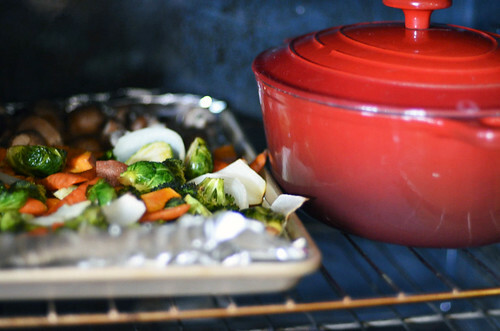 Cover with lid and place pot in oven during the last 20 minutes of roasting time for roasted vegetables. Check risotto after 20 minutes, most if not all of the liquid should be evaporated and the rice just cooked. 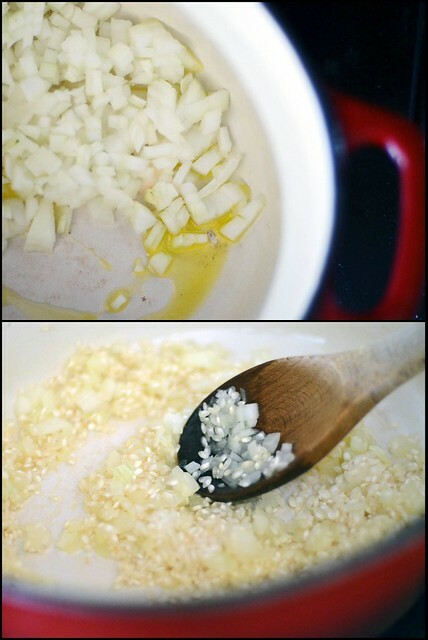 Remove risotto from oven and stir in remaining ¼ cup of chicken broth, butter, and parmesan cheese. 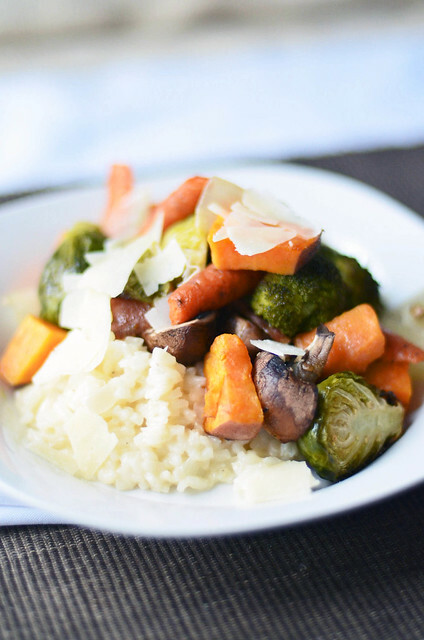 Serve vegetables over risotto. Top with extra parmesan cheese. Adapted from Epicurious May 2012.